A view of the renovated Ace Hotel New Orleans, complete with restored windows including polyvinylidene fluoride (PVDF) coating and reinforced jambs. Ace Hotel New Orleans, which opened in March, has transformed the 1928 Art Deco, nine-story Barnett’s Furniture building into a 234-room boutique hotel with dining, retail, event, and meeting spaces plus a rooftop pool. 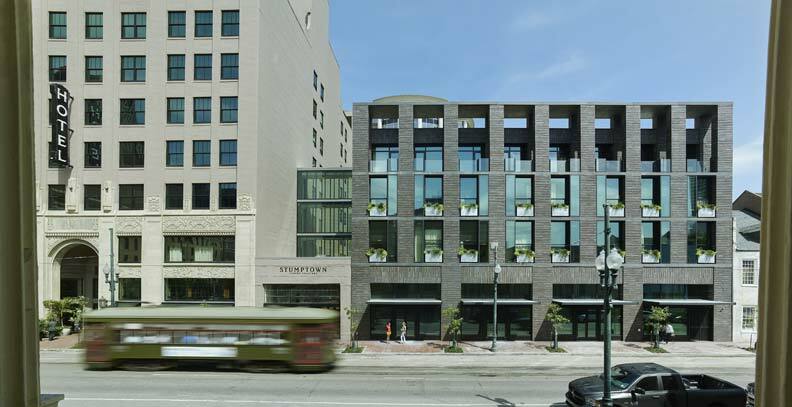 The 17,000-m2 (184,000-sf) hotel, located in the middle of New Orleans’ Warehouse District at the corner of Carondelet and Lafayette Streets, is part of the city’s South Market District development, combining two historic buildings with a new, four-story structure. 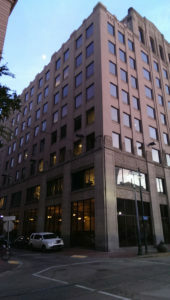 The developer (the Domain Companies) wanted to maintain the vintage, Art Deco-style aesthetic of the building while still meeting modern standards such as hurricane code performance. The project, managed by Broadmoor LLC in conjunction with Palmisano Contractors, was partially funded by federal and state historic tax credits. Its design was led by Eskew+Dumez+Ripple, which located sources to ensure proper restoration of one of the building’s key features—its windows. To restore the historic portion of the building’s exterior, a total window replacement was required. The original 1920s wood-framed hung windows had previously been replaced in the 1980s, with fixed windows that did not reflect the building’s historic character. Eskew+Dumez+Ripple was able to determine the former windows’ proportions and styling through their sourcing. A look at the building’s exterior prior to window restoration, with fixed windows installed in the 1980s. The goal of the window replacement project was to replicate the original windows’ appearance while maintaining modern hurricane code performance. The replacement units were manufactured using aluminum framing with a thermal break and historically appropriate grid profiles. They are designed to protect against extreme temperatures, keeping guests comfortable in the hot Louisiana climate. The windows’ framing and grid were finished in traditional black, and a 70 percent polyvinylidene fluoride (PVDF) resin-based coating was applied to the windows as well. The coatings meet the stringent requirements set in American Architectural Manufacturers Association (AAMA) 2605, Voluntary Specification, Performance Requirements and Test Procedures for Superior Performing Organic Coatings on Aluminum Extrusions and Panels. Additionally, a 100 percent air capture system was used to capture the liquid paints’ volatile organic compounds (VOCs) content, which were then destroyed with a regenerative thermal oxidizer to prevent adverse environmental impact. The heat energy byproduct is then reused to improve process energy efficiency, before the material exits the paint line. To help the existing structure handle the fastener loads of these heavy-duty units, additional metal framing was required to reinforce the jambs without affecting the overall window sightline. The result was an installation that not only restored the building to its original glory and design, but also met the current stringent, high-performance window and hurricane codes.